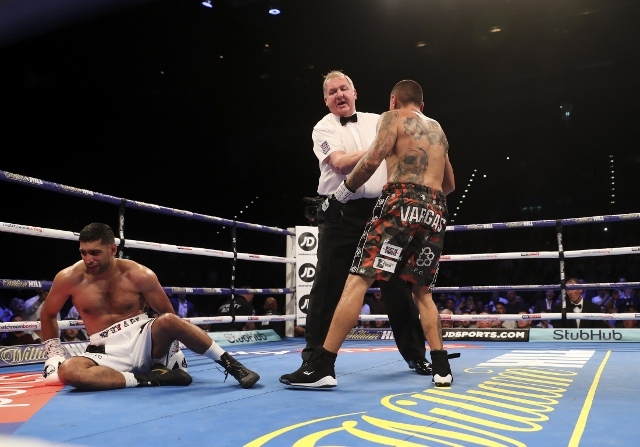 British superstar Amir Khan explained that a change in trainer, combined with some fighting style adjustments in camp, were huge factors in his lackluster performance against Samuel Vargas in his last ring outing. Khan was dropped in the fight and later wobbled in the tenth round. He won a decisive unanimous decision when the smoke cleared. The victory allowed Khan to secure a major fight against WBO welterweight champion Terence Crawford on April 20th at Madison Square Garden in New York City. It didn’t look good that Vargas recently lost a clear decision to aging veteran Luis Collazo, who Khan soundly defeated a few years ago. But Khan explains that he was greatly affected by a quick trainer switch to Joe Goossen. After his longtime trainer Virgil Hunter became very ill, Khan was forced to find a new coach in a hurry and hired Goossen. Now that Hunter is back on his feet, Khan went right back to him. “[Virgil has] known me for a long time, so it’s always better to be with someone who knows you and your fighting style,” Khan told Nick Parkinson. “As you get older it gets harder [and] when you go to a new trainer, it can be hard to adapt to their ideas. Joe Goossen did a great job with two warm-up fights, but I’ve decided to go back to Virgil. “There were a lot of wobbly moments in my last fight and I should have stopped him [Vargas] or knocked him out – he should never have been in the same ring as me.